Below is the payment info for JOs. Deadline is Thur, July 21st. Cost covers the JO entry fee, coaches expenses, and team apparel (shorts/shirt/hat to be distributed). Below are the rosters for JO Quals for 14s & 18s. As stated on the JO document and reiterated at the first meeting, the final JO rosters are not set. Changes can be made based on our criteria you read when RSVP’ing and number of teams that qualify for JOs. 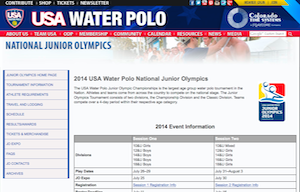 Athletes not on a JO team are still eligible for JOs and local tournaments. Any questions should be addressed with your coach. 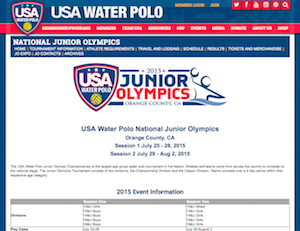 The USA Water Polo home page for the 2015 Junior Olympics is here: http://www.usawaterpolo.org/juniorolympics/. From that page you’ll be able to find the schedule, results, and other information. The girls play in Session Two from July 30 to August 2. JO Gear Order Form – due Monday July 6th! Please be sure to fill out the order form for JO gear ASAP. In order to ensure that the gear is here by JO’s, we need to place the order ASAP. Responses are due by MONDAY July 6th! The rosters for JO’s have been selected by the coaching staff based on the criteria set forth in the summer information document. Great job to all of the athletes who competed – we’re looking forward to an exciting Junior Olympics with the 6 teams that qualified! Book via the website below or call 949-553-8332 and reference Stanford Water Polo Club/Girls JO’s. The deadline for booking rooms is July 7th. Please make your reservation ASAP. All JO information can be found on the JO website here. Additional information, costs, team gear sizing and more to follow. Below are the rosters for all JO Quals teams (listed alphabetically). As we stated these may not be the final JO Rosters. There are still spots available on many teams and those not making JO Quals rosters will be put on local tournament rosters if you can attend. Schedules will be posted as soon as finalized. Below is our summer policy for practice and competition as well as Junior Olympic information and availability links. By completing the Junior Olympics Google Doc you understand and agree to abide by our policies regarding JO’s, JO Quals and team selections. All club members please complete the appropriate link to let us know your JO availability. From that page you’ll be able to find the schedule, results, and other information.